Hi all, This is Suseela and welcome to GUVI Blogs. Many freshers have this doubt whether I have to start my career with a well-established giant corporation like IBM, TCS, Infosys,… or a start-up. my parents and relatives suggested/forced me to choose bigger firms as they are secure. Come on ! the generation of being conservative is gone. This is the time to be innovative/creative/disruptive in thinking. I would suggest you to think well before deciding. I don’t want to sound diplomatic and confuse you more saying that both has its own pros and cons and I will not try to give a exhaustive list of items comparing them and leaving the decision to you. I would suggest you to go with a start-up !!! only point is try to choose the start-up that suits your passion. Its all learning from day one. You are in a sea where not many around you know how to swim in that water, you learn it by yourself. Learning something by experiencing it lasts longer than learning from someone who experienced it. The beginning of anyone’s career is to learn more, and if you learn the basics initially perfectly, your future will promise you more earnings. I see many people struck up with IBM, TCS, Accenture, etc for many years, its not because they liked the company or they are earning more consistently, its just because they are struck 🙂 Their technical learning is limited to the proprietary frameworks of that company. Being in this IT field for more than 9 years and having started my career with a giant IBM made me strongly feel this. And here is why I suggest you to start with a small company. Mr. A started with a small start-up firm and Mr. B started with a big firm. Mr. A is consistently learning new technologies and of course good at basics. Mr. A knows how to deal with a issue with minimum resources available around him. Mr. A’s earnings have increased exponentially because of his good technical skills many companies gave offers to him. Mr. B is good at process. Mr. B’s project gave him less exposure to open-source technologies. 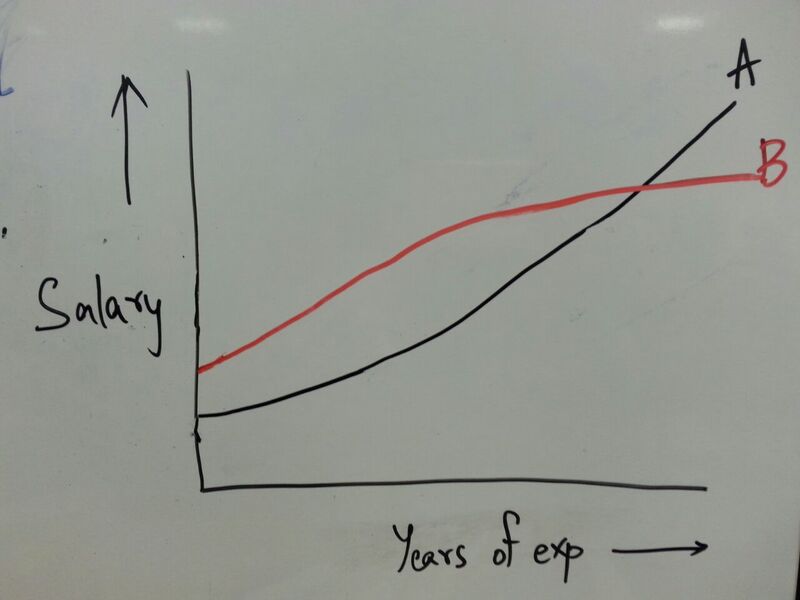 Mr. B’s salary has increased only 5-10% per year consistently through out his career. 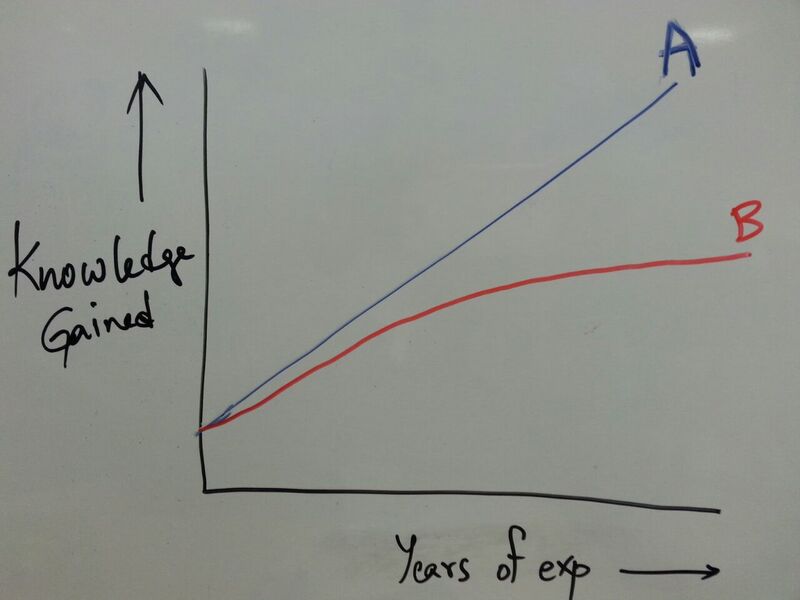 The following graph shows how A and B stack up in terms of Knowledge gained & Salary over a period of years. As you can see, B’s Knowledge & Salary stagnates over a period of time. In my next article I will share points on ” What kind of start-up I should choose as a engineering fresher “, until then good bye and have a nice time ! To start learning technical stuff (C, C++, JAVA, Python, C#, Web Development) in native languages (Tamil, Hindi, Kannada, Telugu & Bengali) for FREE, Please click here. Suseella Panguluri has more than 9 years of experience in IT industry as a Scrum Master and Technical lead. She has domain expertise on dispute and Fraud/Risk management in ACH returns. She is passionate about start-ups and wish to see more women in the start-up ecosystem and technology. You can connect with her on Facebook. Why Every Software Engineer should have played video games?